This is the personal account of Georgia Rytting about a miracle with the Mormon Tabernacle Choir that saved a man’s life. For the Tabernacle Choir miracles are an everyday occurrence. But in 1955, on a rough open sea, Choir members exercised exceeding faith to summon a miracle that transcended music and saved a man’s life. He was a hemophiliac–a bleeder. He was hemorrhaging internally, dying rapidly, and nothing but faith could save him. That man was my father-in-law. The final diagnosis was acute ulcer. Any internal bleeding for a hemophiliac, especially in 1955, was considered serious, even life-threatening. 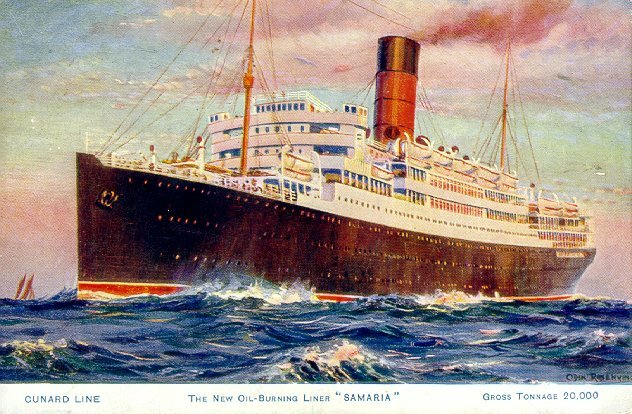 My husband, Ralph and I were two days out of LeHavre, France on a cruise ship called the SS Samaria. We were part of the European tour of the Tabernacle Choir. We had been talking with some friends on the deck of the ship when Ralph began to complain that he was feeling ill, and retired to our cabin. Ralph needed an infusion of whole blood now, but there was no supply on board the ship and there was no cross-matching equipment to test donors. Giving him the wrong type of blood, of course, would kill him. The doctor did the next best thing by giving Ralph a transfusion of three pints of pooled plasma. But the hemorrhaging continued. Finally, the doctor had no choice except to risk calling for donors and giving transfusions of whole blood. We knew that Ralph had O Positive blood and we began a frantic search throughout the ship for anyone that had that blood type. When we had gathered a group of probable donors, the doctor began giving Ralph what was to be a long series of transfusions–fifteen in all. I cannot express the anxiety I felt as each new batch was administered to my husband, each one suspect and potentially lethal. As news of Ralph’s struggle for life spread throughout the ship, a collective effort was made by passengers of diverse backgrounds to petition God for help. The members of the Tabernacle Choir fasted, and some passengers fasted with us. It seemed as though the focus of the entire ship was on Ralph’s moment-by-moment condition. We felt the weight of the prayers. At a critical moment, the Choir members retreated to a secluded area and offered up a special prayer to save Ralph’s life. Passengers followed the Choir’s example and pleaded wit the Lord for Ralph. One woman said to me, “I am not a praying person, but could I go to see your husband? I want to pray for him now.” Another man said, “I am old, but I asked God to take some of my strength and give it to Ralph so he could live.” Such support buoyed me. But just as the miracle of the transfusions was beginning to save his life, another adversity was to threaten it. A violent storm broke upon the ship. The sea became terribly rough and the crew informed us that the conditions would persist for another 48 hours. Our ship was tossed to and fro, almost helplessly against the turbulence. Many people became seasick. The fierce pitching of the ship caused Ralph to lose more blood, and he became so ill that his right lung collapsed. Fearing for his life, I begged the doctor to summon a seaplane to fly him to a hospital. One truth now became obvious to us all: without the ocean calming, Ralph would die. I asked the members of the Choir and many that some supported us to come together and pray for the storm to cease. It did. An hour later, a friend came to me and said, “Did you ever see such a beautiful sea?” From Ralph’s room in the infirmary, I looked out a porthole at the glassy, calm water. The sun had just broken through the clouds, beautiful, bright, clear. The calm provided Ralph a respite for the night and his condition stabilized for a few hours. Then, early in the morning, his body began to fail. His heart started beating so rapidly that the doctor couldn’t make an accurate count. Suddenly, Ralph’s heart stopped altogether. As the doctor feverishly worked to revive him, I stood back and pled with the Lord to intervene. The doctor managed to revive him, but for the next 36 hours Ralph was to face the worst period of his battle for life. He held my hand limply and said he didn’t know if he had the strength to hang on. He said that he felt as though his spirit was fighting to leave his body and if he let up for just one moment his spirit would slip away. On Thursday morning Ralph “died” and was resuscitated for the third time. When he regained consciousness, he turned toward me so weak that he could hardly move. He was perspiring profusely. I sat beside him and stroked his forehead. “What chances have I got?” he asked me. His tone was that of weariness. He had no fight left in him. Before I could answer, Ralph closed his eyes and fell into a deep, peaceful sleep. I bowed my head there at his bedside and a feeling came to me as if to say, He has suffered enough. I shall always remember that Saturday morning when Ralph was wheeled from the SS Samaria to a waiting ambulance in Quebec. The entire side of the ship was crowded with 1,200 friends–Choir members, crew, passengers, and medical staff–who had fought for Ralph and prayed for him. They waved, applauded and cheered us. That memory and knowing the infinite goodness of God will last us a lifetime. Click here to receive a free sample of my book, Portrait of a Zion Person. Follow our Internet missionary project: www.gospelideals.org. And LIKE us atwww.Facebook.com/gospelideals.